The indefatigable Zonka has translated another Danish newspaper article. His comments are in italics, followed by the text of the article. Below is a translation from today’s edition of Jyllands-Posten. 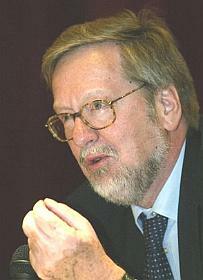 A few background notes — Per Stig Møller, the conservative foreign minister, has traditionally been in the multi-cultural camp, which has put him at odds with the national-liberals (the faction the Prime Minister Anders Fogh Rasmussen, belongs to) at times, and he has been overruled on several occasions by the PM. As such he is showing progress in coming out with this analysis of the situation; however, his suggested solution — dialogue, dialogue, dialogue — is the same old song, that has been tried for so long without success, since no dialogue has yet come up with anything but concessions to Islam! The fanatic Islamists are just as totalitarian in their way of thinking as the Communists and the Nazis, the foreign minister believes. “I have noted, that some are saying that it only a minority of extremists, who don’t have the same power that the Nazis and the Communists had in their time, however, that is taking the threat too lightly. Communism started with a few loons playing chess in Zürich, and the Nazis were a bunch of jerks in the beer halls of Munich. One must never underestimate a totalitarian movement in the making,” says the foreign minister. “The fanatic Islamists are just as totalitarian in their way of thinking. Which can be seen in Afghanistan during the Taliban and other places where they are in power. Then everybody is forced to live in unification and books, movies and music is banned,” says Per Stig Møller. He adds that the totalitarian forces in the Islamic world also were a major reason for the escalation of the Mohammed crisis in January and February. “The limit is drawn at those who wants to change our society with violent means. Everything else is dialogue,” says Per Stig Møller. A look at history ought to give us extra motivation to seek a peaceful co-existence with the Islamic world. It has historically always been the culture, which had the largest population growth that expanded and right now the European populations are receding, he states. But peaceful co-existence doesn’t mean that we should limit the freedom of speech to avoid offending religious feelings. “Europe’s spiritual development is built upon freedom of speech. Just because somebody believes that the freedom is being misused to criticize and make fun of their religion doesn’t mean we should change that,” states the Danish foreign minister. Many, many more have to reach this realization and then act on it in Scandinavia and Europe before things begin to change. Problem is that I do not percieve Islam prepared in the least to reform itself. Islam will never assimilate into European culture without a major reformation and it will take generations to occur. The West does not have that time unless Islam is again contained and isolated until such occurs. Ootherwise the West will be swamped and overrun by weight of numbers. BTW - may ITALY win....just to put the Frogs in their place. "but surveys show that there is a majority for reforms in the muslim world"
This is just the sort of addled wrong headed nonsense that masquerades as legitimate though on the "continent." When has the majority's wishes and aspirations EVER mattered in the Muslim world? Of course the majority want peace and tranquility. This has ALWAYS been so for all human societies. It is after all the human condition. You might as well say that gravity exerts an earthward pull. Or that the sky is blue. Or some other such profundity. But when a rabid minority is equipped with powerful ideas with the imprimatur of Allah all bets are off. The Koran, a hate manual, will always trump the majority. It has always been so. When Moller speaks of "dialogue" one has to wonder if he has any meaningful insights into the problem besetting his nation. In 1786, Thomas Jefferson and John Adams were ambassadors to Paris and London, respectively. Because America had suffered disruption and attacks on its ships by Muslim pirates, they met with and asked the representative of what is now modern day Libya, Sidi Haji Rahmand Adja, why the Muslims were doing this (they had been doing it against Christian shipping for centuries). (Adja said) "“…that it was founded on the Laws of their Prophet, that it was written in their Koran, that all nations who should not have acknowledged their authority were sinners, that it was their right and duty to make war upon them wherever they could be found, and to make slaves of all they could take as Prisoners, and that every Musselman who should be slain in Battle was sure to go to Paradise.”"
This problem has been around for a long time. OK, I'm glad that someone has finally dared to come out and say something that I and many others have been saying for long time. The question is, would he have said this 12 months ago? I think not. "A look at history ought to give us extra motivation to seek a peaceful co-existence with the Islamic world." Sorry, but that is naive and basically impossible. Looking at history should have taught him that much. beat them up or worse. or Marines much anymore. They lose. I agree with the commenters - the Foreign Minister is talking out of both sides of his mouth. I wonder, who is he trying to charm - the EU? To survive, Denmark ought to base its planning on the necessity of turning itself into an economic, political and cultural island. "Peaceful co-existence" is not at all the thing they should base their forecasts and preparations on, and it would be a positive step to stop talking otherwise.